In Shanghai, Uufie designs a new location for the department store Ports 1961 that shines with LED-embedded satin glass bricks. It sits like a berg afloat in a sea of concrete – icy white, cool and compelling. 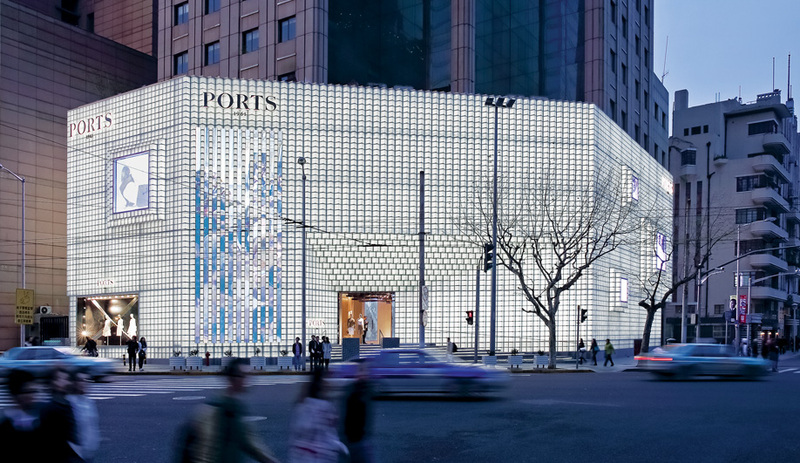 Ports 1961’s newest location offers the upscale commercial intersection of Changde and Nanjing West Roads in downtown Shanghai a facade unlike any other. Conceived by Toronto design and architecture firm UUfie and engineered by T/E/S/S Atelier d’ingénierie of France, the three-storey structure consists of 8,000 LED-embedded satin glass bricks and scores more custom-made L-shaped blocks. Its angles create a zigzag embrace of the building, enlivened by four show windows with LED screens projecting the Canadian fashion company’s latest looks. 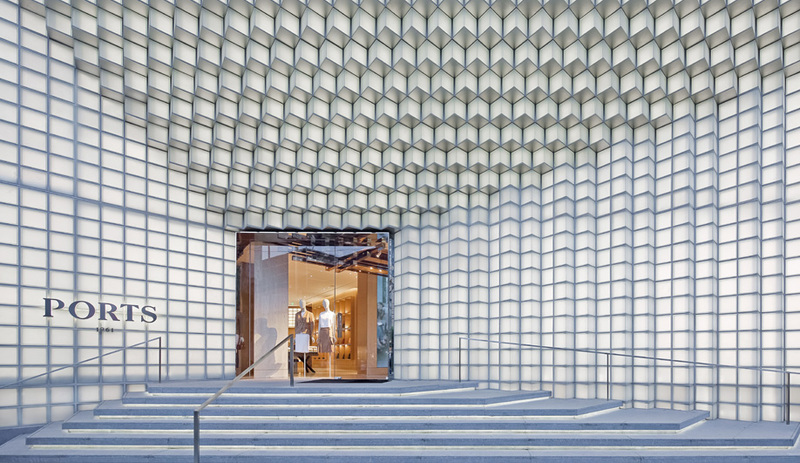 The off-centre cantilevered canopy at the entrance seems intended to mesmerize passersby, drawing them into the store’s depths. UUfie principal architect Eiri Ota credits a steel jointing system, crafted specifically for the project, for producing the canopy’s hypnotic, M.C. Escher–esque effect. During the day, the semi-transparent bricks absorb sunlight with little reflection, making the exterior appear muted and monolithic. At night, though, tiny LED strips in the mortar surrounding each glass block light up, collectively giving off an icy glow.